When my family lived in the tiny out of the way town of Washington, LA, we’d frequently eat at the Steamboat Warehouse – it was one of the few restaurants in town. It was also convenient because it was just down the street from our house. As you can guess from the name, the restaurant is located in an old Steamboat warehouse along Bayou Cortableau in Washington, LA. In the 1800’s, steamboats would frequently transport cotton down the bayou, which is located just behind the restaurant. The restaurant still exists today and we dined there in 2013 and the food was delicious. I can say that the atmosphere and the food quality are definitely worth a trip if you’re in the area. There’s a deck along the bayou if you’d like to get some fresh air before or after dinner. I’ll never forget the “paddlewheel potatoes” and shirley temples I enjoyed there as a child during our family dinners. During my last visit there, we happened to go on a Saturday night and there was a long wait for a table. I was getting frustrated as it seemed we’d never be seated for dinner. A few moments after we were seated and ordered our meals, I looked down at the table and found this signature my father left in 1985. I was there on February 2, 2013. 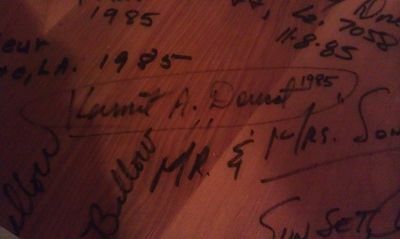 Twenty-eight years prior, our family sat at that table for a meal and my father left his autograph on that table. The table tops were sealed and the graffitti was preserved. What a glorious gift to see that familiar signature. It made me realize that even though the wait for a table frustrated me greatly, we were meant to be seated at that very table that night. What are the chances of that happening? I was astounded and it’s times like these that make me believe that there are some signs of our loved ones who have passed on. My father died in 1998 and not a day goes by that I don’t think of him and wish he were still here.